Hello, happy new year! I thought I’d do a very quick post of some plates in the kiln. This is the baby in my family of kilns. It is a Coneart kiln from Tuckers Pottery in Ontario, one of three Conearts that I have. I own 5 kilns in total. My two raku kilns are econo kilns, by L&L and are manual electric fired kilns that are older than me! The Tuckers kilns are digital, which means I can set the firing schedule and go home to bed. Let me tell you, it makes a big HUGE difference that I don’t have to drag my sleepy body over to the studio to turn up the kiln again a few times in the middle of the night, it is all done for me through the wonders of technology. Tuckers has been a great company to deal with. They are friendly, professional and make excellent products. I get my clay from them too. The reason I got this tiny kiln, which was a bit of an indulgence for me as I didn’t NEED it, was to be able to do quick, small firings. My other kilns are much larger, the biggest one is oval, and is 42″ wide, by 32″ across and 27″ deep. It is really huge and I have to stretch to put things down onto the bottom shelf. I have actually heard stories about people falling into their large kilns, but it hasn’t happened to me yet! I can fit months worth of production into one firing of that kiln. The middle sized kiln is 23″ wide and 27″ deep and is the kiln I use the most. 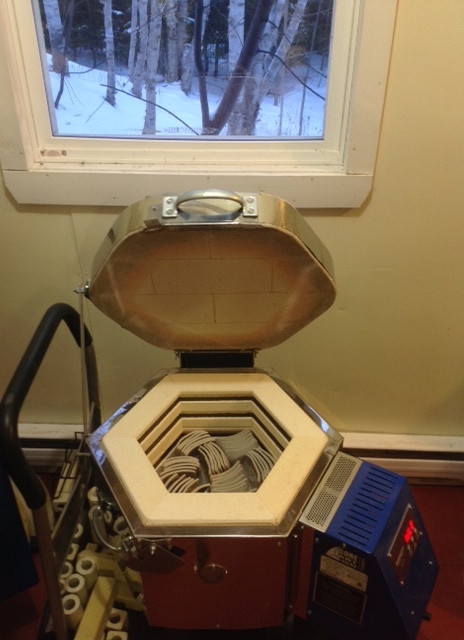 Now, this wee baby kiln is 11″ wide and 9″ deep. You would think that it would hardly hold anything, but it holds all those little plates. (59 of them!!) I will have to use the middle sized kiln to do the glaze firing, but for the bisque firing, where the pieces can touch it is perfect. The other thing I really like about this kiln is that it cools off really quickly. Sometimes in the summer I run out of a few different designs in my shop and I just want to make a couple of each to get the shelves stocked up again. So I can fire this kiln in the morning and by late evening I can take the pieces out and glaze them because it fires quickly and cools off quickly too. 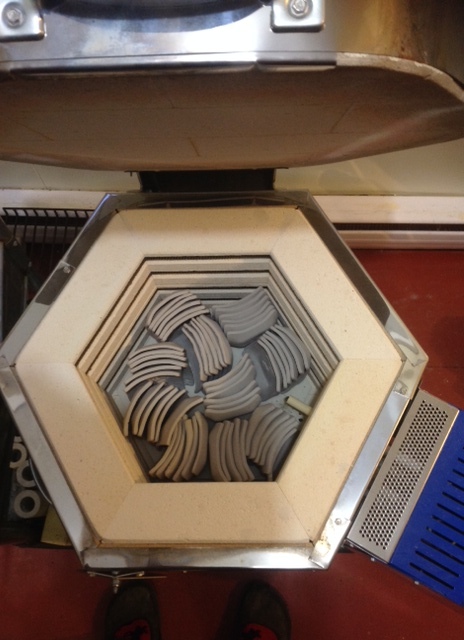 I can fit a lot of my small pieces into this kiln and it has actually turned out to be quite an asset. So, back to this photo. I have an order for some of my small plates to be used as favours for a wedding in Mexico. You can see how I make these plates by clicking here. These ones are just over 3″ square and I made 59 of them. Why 59 and not 60? Well I rolled out two large slabs of clay to cut the plates from. Out of one slab I cut 30, but the other only offered up 29. Tomorrow is supposed to be a big storm here, so I will be cosied up in my studio with the wood stove going, listening to a James Herriot book on tape and glazing plates.